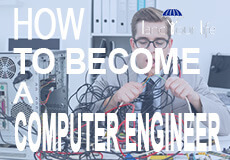 In the following Land Your Life guide, you will find out how to become a Computer Engineer. Interested in following in Steve Jobs’ footsteps? This career may be your ticket. Computer engineers are responsible for creating exciting new advances in computer technology. Computer hardware engineers usually work in research labs. Most are employed by high-tech manufacturing companies, and some may work long hours on tight deadlines. Approximately 20% of computer engineers work in computer systems design and related services. 17% work in semiconductor and other electronic component manufacturing. 12% work in research and development and 12% work in computer and peripheral equipment manufacturing. An additional 7% work on navigational, measuring, electromedical and control instrument manufacturing. Students planning to study computer or electrical engineering in college will need a good grounding in math and science. Knowledge areas to develop are computers and electronics, engineering and technology, design, mathematics and physics. For most computer engineer roles, strong English language skills will be needed as well. Internships while in school or during summer holidays can demonstrate practical expertise and interest. Contacts made may lead to paid, permanent employment after college. Summer work in computer manufacturing can also be helpful. There are no uniform requirements for becoming computer hardware engineer, but most employers want their engineers to have a bachelor’s degree in computer engineering. Additionally, most employers will prefer a program that is accredited by ABET (formerly the Accreditation Board for Engineering and Technology). Computer engineers (also known as computer hardware engineers) design, develop and test computer systems. This includes hardware components such as processors, memory devices, routers, networks and circuit boards. Some computer engineers design non-computer devices that incorporate computer components. Examples include cars and medical technology. Additionally, computer hardware engineers ensure that hardware components work with the latest software. That requires them to work closely with software developers (for example, they would jointly develop the hardware and software for a mobile phone). Computer hardware engineers may also test computer code or do some basic programming as part of their work. What Does an Average Day Look Like For A Computer Engineer? Most computer engineers perform their work in computer research laboratories. Their employers may highly control their work environment to protect trade secrets. Computer engineers must stay up-to-date on trends and new technology. Computer components must be exhaustively tested, before mass manufacturing takes place. Computer engineers are responsible for testing completed models of computer hardware. This requires careful documentation, the ability to repeat conditions, and documenting changes in test elements. Computer engineers work to design new computer hardware, including components such as processors, circuit boards, networks, routers and memory devices. As part of the design process, they create blueprints of the equipment. The design process also includes needs analysis, which requires the engineer to research and understand what users really want and need to do with the technology. When test results don’t meet goals, computer engineers are responsible for figuring out why, modifying product design, coming up with solutions and creating new test plans. Updating equipment: software is always changing. computer engineers are responsible for updating existing equipment so it will work with the current software. Computer engineers may be in charge of manufacturing oversight. In this role, they ensure manufacturers build components correctly. Computer engineers might be managing technicians, engineering design staff or manufacturing staff. Computer engineers document hardware processes in detailed functional specifications. Others use these functional specifications in manufacturing as well as testing. They can include everything from components, materials, quality levels, power supply requirements and configurations. Computer engineers commonly work with computer software systems and are expected to have some programming familiarity. Additionally, some design work must be done in close cooperation with software engineers. For example, smart phones require in-depth partnership between hardware and software engineers. A growing number of devices include computer components (for example, medical devices and cars). Computer engineers, working on these devices, work closely with domain experts to design features, create improvements and test equipment. Computer engineers may also be providing technical support and assistance to other, non-technical team members. This can include marketing and sales teams, as well as front-line technical support staff. Computer engineers will work with a combination of hardware and software technology on a daily basis. These can include using circuit testers, electronic measuring probes, integrated circuit testers, network analyzers and signal generators. Software might include analytical or scientific software, computer aided design (CAD) systems, development environment software (for example, Visual Basic), object or component oriented software (for example C++ or Perl), and operating system software. Are You Suited for A Career As A Computer Engineer? Computer engineers, generally, have at least a bachelor’s degree in computer engineering. They should be able to handle college level math and science course work, as well as some computer programming. Computer engineers need to be able to understand and work with principles of electrical engineering and computer science. During their careers, they are also expected to stay current with technology development and trends. Computer engineers are tasked with improving already-complex equipment, as well as testing new equipment and components. Successful engineers are able to analyze and break down problem areas. They are able to contemplate individual component function as well as whole system operation. In complex system and component design, all assumptions and goals must be clarified and tested. Computer engineers must be able to deploy logic and reasoning to examine all aspects of a project, sometimes eliminating or redefining requirements. Computer engineers design new hardware and components. This requires the ability to think creatively and experimentally about every aspect of a system design. Computer engineers typically work full time, generally during business hours. Sometimes they work on tight deadlines and must put in long hours. Their work environment is usually a computer lab. Computer engineers are generally well paid, compared to other professions. While there’s no single certification for becoming a computer engineer, most employers want engineers who have a bachelor’s in computer engineering. Other reviewers may use different rating systems. Schools located near high-tech manufacturing facilities should be considered as well, as they may offer local internships. How Does a Computer Engineer Find Work? Most computer engineers are employed by high-tech manufacturing firms. Some jobs are opening up in medical device manufacturing and automotive manufacturing. Computer engineers should earn a bachelor’s degree in computer engineering. A solid understanding of electrical engineering and computer science are helpful. Choose a school that is ABET accredited. If career plans are to work on components of non-computer devices (for example, medical equipment), look for opportunities to get work experience or complete related coursework. The Bureau of Labor Statistics (BLS) estimates that the median annual wage for computer hardware engineers was $115,120 in 2017. The five top paying industries for computer engineers are computer and peripheral equipment manufacturing, semiconductor and electronic component manufacturing, computer systems design and related services, navigational, measuring, electromedical and control instruments manufacturing, and scientific research and development services. Job growth estimates for computer engineers are about 5% from 2016 to 2026, according to the BLS. This is about average for all occupations. Though technology continues to evolve at a rapid pace, this average growth is due to more innovation being in software than hardware systems. One positive driver of computer engineer job prospects is the increased use of hardware in non-computer devices such as household appliances, medical devices and autos. The BLS also estimates that computer engineering jobs are less likely to be outsourced than other technology careers. Computer engineers with higher-level degrees or deep industry experience will have the best job options. Candidates with degrees from ABET-accredited programs will also have an edge on the competition. There are many organizations around computing, software and hardware development. Most universities offering a computer engineering degree also have organizations or societies. ABET’s mission is to accredit college and university programs in the disciplines of applied science, computing, engineering and engineering technology at the associate, bachelor and master degree levels. With more than 60,000 members, the IEEE Computer Society is one of the largest membership organizations dedicated to computer science and technology. IEEE hosts conferences, offers a job board, professional education and more. IEEE stands for Institute of Electric and Electronics Engineers. They offer many publications including IEEE Computer Architecture Letters, Affective Computing, IEEE Transactions on Computers, IEEE Transactions on Mobile Computing and more. The Association of Computer Engineers and the Association of Computer Engineers and Technicians (ACE-ACET) promote professional standards within the industry. American Society for Information Science and Technology (ASIS&T) attempts to bridge the gap between information science practice and research. The Association for Computing Machinery (ACM) focuses on advancing computing as a science and profession. The Association for Women in Computing (AWC) supports women attempting to work in computer sciences. The Computing Research Association (CRA) attempts to strengthen research and advanced education in computing. The Journal of Electrical and Computer Engineering is a peer-reviewed, open access journal that publishes original research articles. Computers & Electrical Engineering features novel implementations of computers and computational techniques. The International Journal of Electrical and Computer Engineering (IJECE) is the official publication of the Institute of Advanced Engineering and Sciences (IAES).